Are you looking to build your list? Do you want to build your own tribe of people who “get” you? People who love your stuff? People who are hanging on your every word and waiting for that next blog post or email to drop? It’s a great big internet world out there and first, you’ve gotta get their attention somehow. Your lead magnet is how you make that happen. Whether it’s a brand new email list or an existing list you’re wanting to grow, you need an AWESOME offer to get them in the door. If you want to generate leads, then you MUST have something to bring them in. All businesses need this. If you’re a blog, you need this. If you sell services, you need it. Every business or brand needs a lead magnet. 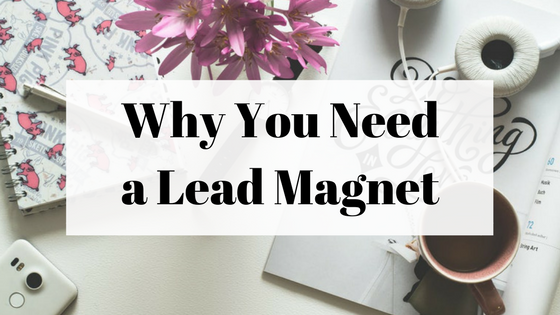 What’s a lead magnet? This is a free offer you make in exchange for an email address (and sometimes additional info). It’s essentially a “bribe” that you’re giving in exchange for their details. For it to work successfully, you need to give them something of value. This is more true today than ever before due to the pure saturation of content on the internet. People aren’t just giving up their deets all willy-nilly now. People are sick of being spammed. They’re tired of the thousands of emails they get every day and in the never-ending quest for Inbox Zero, they are NOT going to give their info over to one more blog/brand/whatever to get spammed some more. Let’s get back to that lead magnet. What is it? It could be an ebook, a video, a guide, a checklist, a printable, or even a free trial. Studies have shown that online users consume information better when it’s in bite-sized and easily digestible pieces, so don’t get too long-winded. You can add value without being super long. But what does it mean to add value? So, what might this be? You could touch or one or more of the pain points your target audience faces. Give them some free tips on how to solve that pain point. This is how you can solve a real problem that they currently face. This shows your expertise while also building trust in the relationship. You can also promise one quick win. What is ONE thing you can do for them right now, right here? Perhaps a video, a downloadable PDF or a checklist can answer this question. Reel them in with the quick win, and show them there is more where that came from if they want to stay on your list and in your circle. Be SUPER specific. This is one thing I see clients get wrong in their lead magnets all the time. They want to get lots of people to sign up, so they remain too general. “How to Save Money” or “How to Start a Blog” are too general, especially these days. The internet is saturated with that stuff already. You’re going to need to dig deeper. Get specific. Then when you think you’ve got it, dig even deeper. Where is the value? Everybody and their grandma is offering something for free these days. It’s like when they try to push those free samples on you at the supermarket. You’re just trying to get some groceries and here they are with the cracker samples and then the sausage samples, and maybe even some new cookie flavors. At first, you might be on board. Hey, free food, right? Who says no to that? But if there’s an offer on every aisle… and every time you go to the supermarket, it loses its appeal. It can even start to feel pushy. You may find yourself dodging that aproned lady with the tiny toothpicks of cheese because dammit, you just want to pick up some Pop Tarts and be on your way! With so many free offers tempting people to give up their email addresses, what makes yours special? When they give up their info, they’re taking a risk. They’re inviting you into their virtual home. They are giving you permission to come inside and maybe even to kick off your shoes and stay awhile. Are you going to be a good guest? Or are you going to put your dirty feet on the coffee table and pee on the rug? Give VALUE and RESPECT the relationship. No bait-and-switch. No tricks. No games. No spam. Give a sampling of what you offer in a course, or a free trial to your paid program. This is a good way to help, while also showing the additional value they get if they become a paying customer. You MUST demonstrate credibility. Why are you an expert on this? How can you prove it? Why should they trust you? Why should they listen to you instead of all the other voices vying for their attention online? Also remember to be quick. People are busy. No one has time to pore through a thesis-sized manuscript while you prove to them you’re an expert on XYZ. Give them value, make it instant (no one wants to wait on your freebie either) and make it easy to digest. Now, THAT’S how you create a winning lead magnet. This is the first step to a sales funnel that builds trust, strengthens relationships, and increases profits. Don’t be intimidated by the idea of a “lead magnet”. Think of it as an offer – or a sampling of who you are and what you do. What do you have of value to offer, and why should people care? If you’re not sure, I can help you figure it out. A successful sales funnel begins with a great lead magnet and I’ve helped hundreds of satisfied clients over the years with theirs. Now’s your chance to get my help at a discount. I’m offering it on sale at 50% off, for a limited time only – making it only $300. This is all great info! You have included everything that’s important that I would want to give as a blogger, and receive as a reader! Great points. You have to draw your reader in with a great title. Thanks for the tips.